Chase provided all supervision, work control, equipment, and labor for completing investigative borings at the Paducah Gaseous Diffusion Plant (PGDP) beneath a former burial grounds. The areas investigated contain potentially high concentrations of trichloroethylene and related degradation products. Radionuclides, PCBs, heavy metals, and semi-volatile organic compounds are also present. In order to obtain samples beneath the burial grounds, Chase personnel drilled thirty two borings at a 45 degree angle. The approximate vertical depth of the borings was 60 feet. Three-100 foot deep vertical borings were installed and six shallow borings for the sample collection. The drilling equipment was decontaminated prior to leaving the site. Equipment used in radiological contaminated areas was surveyed to verify that all transferable contamination was removed. Chase and its teaming partners (Project Team) provided supervision, work control, equipment, and labor for completing over 213 borings at the Paducah Gaseous Diffusion Plant (PGDP). Borings were to be used for installating of Electrical Resistance Heating (ERH) equipment and associated extraction wells, sensor probe wells, and monitoring wells as part of an interim remedial action to address volatile organic contaminant source(s) at the PGDP. The saturated and unsaturated subsurface at the PGDP contain potentially high concentrations of trichloroethylene and related degradation products. Radionuclides, PCBs, heavy metals, and semi-volatile organic compounds may also be present in the soil and groundwater in the vicinity of the C-400 Building. Health and safety concerns were closely monitored and addressed at all times. 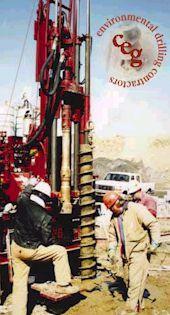 All borings were advanced utilizing both sonic and hollow stem auger drilling technology. The borings were vertical and extended to depths of 40 to 100 feet below land surface. Initial Site Investigation: Direct-push, Geoprobe®, sampling equipment was used to advance the soil borings, 129 boring location, to collect discrete soil samples for visual classification, field screening and laboratory analysis. Boring locations were placed on a 20-feet grid pattern to systematically cover the identified areas of concern. A total of 269 soil samples were collected, logged, containerized, labeled, placed under chain of custody protocols, and handed to Sierra Mobil Labs, Inc., a mobile laboratory located onsite and analyzed for volatile organic compounds using United States Environmental Protection Agency (USEPA) SW-846 Method 8260B. Additionally, a total of 15 groundwater monitoring wells were gauged, purged, and sampled as part of these activities. Each groundwater monitoring well was sampling in accordance with EPA accepted protocols. Phase 2 / Site Groundwater Investigation: Based on the preliminary evaluation of the 15 existing site wells, all but one well was abandoned by grouting the casing, over drilling w/6.25 augers and grouting to surface. Three test holes were drilled into bedrock to provide hydrogeologic data on the occurrence and movement of groundwater prior to installation of bedrock monitoring wells. 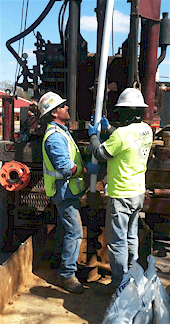 NQ wire line air cores (2.25 inch OD) were collected utilizing our CME 75 drill rig. The total depths of the test holes were 80 to 100 feet to the top of the underlying Borden Formation. Upon completion of the rock coring activities, pressure permeability testing (packer testing) was performed at 10-foot intervals to the total depth of the hole. Upon completion of the packer testing the hole was over-drilled utilizing a 6-inch diameter roller cone bit to enlarge the diameter of the hole to allow for the down-hole geophysical testing. The 3 coring locations were converted to monitoring wells. Additionally, three groundwater monitoring well pairs consisting of a shallow soil/rock interface well and a deep bedrock well were installed. Upon completion, all wells were sampled per EPA methodology and report of findings provided. Chase personnel were involved in a project which advanced numerous borings within an active railroad bridge approach to assess the effects of a recent brush fire on the materials used to construct the approach. Chase personnel determined the lateral and vertical extent of the embankment which was effected by the fire and identified areas which remained as “hot spots”. Additional borings were advanced along the perimeter of the “hot spots” and were filled with high solids bentonite grout in an effort minimize the potential for spreading and re-ignition of the smoldering areas. Chase personnel were involved in the installation of several piezometers, groundwater observation wells, and slope inclinometers in support of a highway construction project adjacent to a U.S. Army Corps of Engineers (USACE) dam. All work was performed in accordance with USACE specifications and under direct USACE and material manufacturer’s supervision. Chase personnel installed in excess of 10 permanent groundwater monitoring wells in support of a Phase II Site Assessment at an active rail yard. Site activities included working in close proximity to, and in some cases on, operational rail lines. Chase personnel abandoned a cluster of four 4-inch diameter monitoring wells at an inactive solid waste landfill. Abandonment included removal of the surface completions and protective covers, over-drilling of the well casing using both hollow-stem auger and air-rotary drilling techniques, removing the well casing, and backfilling of the boreholes with high-solids bentonite grout via tremmie pipe. This project was completed in accordance with Kentucky Division of Waste Management regulations and under the supervision of Kentucky Division of Waste Management inspectors. Chase personnel completed a complicated sample collection and well installation plan at an abandoned creosote treating facility. This includes hollow-stem auger sampling, installation of stainless steel monitoring wells, abandonment of damaged monitoring wells, rehabilitation of existing monitoring wells, and near-surface sampling utilizing hand augers and direct-push technology. Chase personnel conducted a rehabilitation project to correct biofouling and sedimentation problems in several monitoring wells at a major chemical production facility. This included the controlled introduction of acetic acid into the wells, surging and scrubbing of the interior of the casing, sediment removal, re-development and pre and post-project aquifer testing. Chase installed eleven monitoring wells, some in excess of 70 feet total depth, at an active industrial complex. Project duties included well installation and surface completion in strict accordance with USEPA Region 4 Guidelines, well development, aquifer characterization, and groundwater sample collection. Chase personnel installed multiple monitoring wells into a thrust fault zone in support of an on going assessment of an inactive industrial dump site. 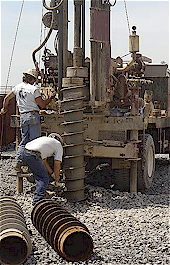 Due to the karst nature of the surrounding topography, including the presence of subterranean caverns and sink holes, several specialized double casing techniques were employed to insure the integrity of the wells while minimizing the potential for contaminant migration along the annular space of the borehole. 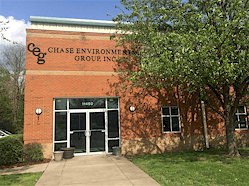 Contact us to see how we can help you with your Environmental and Geotechnical Drilling Services, email toddmills@chaseenv.com or call 270-488-2584.